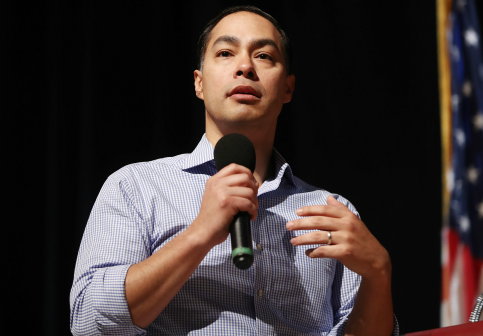 Former secretary of housing and urban development Julian Castro is silent on how much his campaign raised in the first 24 hours of his candidacy, despite the transparency of his competitors for the 2020 Democratic presidential nomination. Castro, who was one of the very first Democrats to announce his presidential candidacy despite never having run for statewide office, has not discussed fundraising on the campaign trail. Instead, Castro has responded to concerns over his viability by painting himself as an underdog willing "to crawl through all 50 states and knock on doors to get support." The candidate's silence, however, stands in stark contrast to more high-profile contenders who have touted their 24-hour fundraising totals as a show of broad grassroots support. On Monday, the campaign of former Texas congressman Beto O'Rourke announced that it had a set a record by raising more than $6 million in its first full day. "In just 24 hours, Americans across this country came together to prove that it is possible to run a true grass-roots campaign for president," O'Rourke told the Wall Street Journal. The sum surpassed the first-day totals of Vermont senator Bernie Sanders ($5.9 million) and was significantly larger than the $1.5 million raised by California senator Kamala Harris. Castro's campaign did not respond to questions as to how much his campaign raised in its first 24 hours. It is further unclear how much the campaign, which has refused to accept any PAC donations, has raised to date—the FEC reporting deadline for the first quarter of this year has not yet passed. James Dickey, the chairman of the Texas Republican Party, told the Washington Free Beacon the candidate's silence on the topic was an answer in and of itself. "America is just confirming what we already knew about Julian Castro—nobody knows who he is," Dickey said. "His biggest accomplishment was being appointed an ineffective HUD secretary during the Obama administration. Simply put, he is not an exciting candidate." Since entering the race in January, Castro's campaign has failed to register in most early primary polls, often failing to rise above the low single digits. A recent survey by Morning Consult found Castro's support at 1 percent, just behind Washington governor Jay Inslee, Sen. Amy Klobuchar (Minn), and the catchall category of "someone else." There are outstanding questions about continuing support for Castro now that O'Rourke has officially joined the race. The two men are seen as occupying similar positions in the 2020 field given their home-state ties and support among Latino voters. "Beto is a de facto Latino, he grew up and lived on the border, he has a Latino nickname, he speaks Spanish fluently," Colin Strother, a Democratic strategist that previously advised Castro, told the Free Beacon. "He certainly understands that community and shares many of their characteristics and values, so its a natural constituency for him." If O'Rourke were to eat into Castro's support and force him below 1 percent in the polls, then the former secretary would be forced to rely on meeting a grassroots fundraising threshold to qualify for the first Democratic debate in June.